In the 1960s as the civil rights struggle deepened, Billy Graham prayerfully canceled engagements in Europe and took his team on a preaching tour of the deep South. Part of that tour included Birmingham, Alabama, in 1964—just six months after the 16th Street Baptist Church bombing that killed four African-American girls. Billy Graham later visited Birmingham in 1972 for a one-week Alabama Crusade. 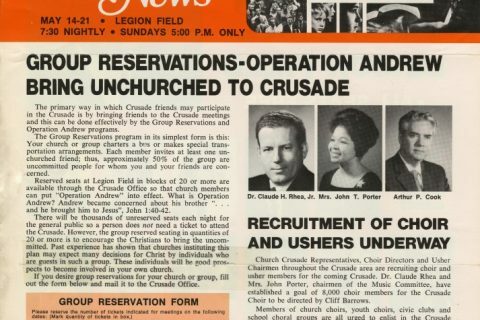 During a time of great racial unrest throughout the South, Billy Graham was invited to Birmingham, Alabama, to preach on Easter Sunday in 1964. The bombing at the 16th Street Baptist Church in downtown Birmingham which took the lives of four black girls had occurred just six months earlier. It was a tense time in Birmingham, but the presence of Billy Graham Evangelistic Association was greatly welcomed by many churches. A crowd of 35,000 gathered on that Sunday afternoon at Legion Field. Law enforcement was on high alert and armed state troopers clustered around the track. Yet, the claim of Jesus Christ upon the hearts and lives of those who came that day was clear. Some 4,000 people poured from the stadium stands onto the turf in response to the invitation to accept Christ. The world took note of what happened in Alabama’s chief city. The international press carried the news that the largest interracial crowd in the history of Alabama had met without incident. Columns were devoted to racial harmony in the choir led by Cliff Barrows, the corps of ushers and the platform party, which included members of the city council. That afternoon, the choir sang “Christ The Lord Is Risen Today” and other hymns before George Beverly Shea performed. Mr Graham preached from the familiar verse of John 3:16. On a personal note, as a senior then at Howard College (now Samford University), it was my honour, privilege and blessing to attend this historic service along with other classmates. Everyone who attended will never forget this powerful and eventful service. 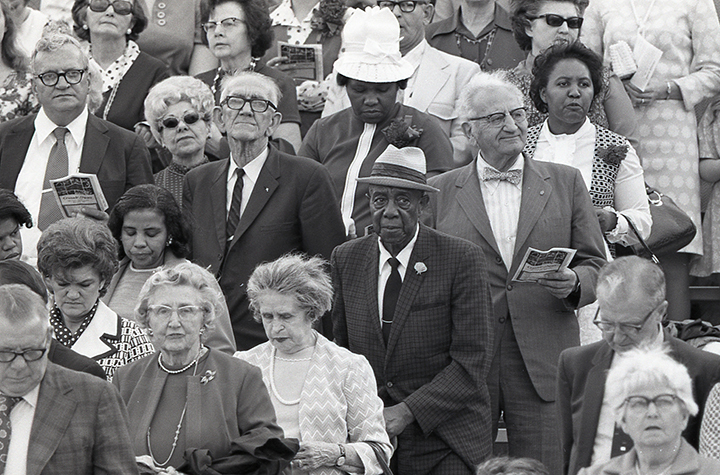 This Billy Graham Crusade was held on Birmingham’s 100th birthday and during Pentecost week. Still, there was a need for more. Materials like this were distributed to church leaders and volunteers in preparation for the Crusade. The people of Birmingham and surrounding cities flocked to the Crusade. Believers around the world were praying for Birmingham. Before the eight-day Crusade began, a School of Evangelism session drew more than 1,000 ministers and theological students for five days of study and preparation. Crusade Director Charles Riggs estimated that 1,600 churches participated in the Crusade. Their members visited 75,000 homes and formed 4,500 home prayer groups. In addition, 2,500 adult group leaders were trained and youth study groups in 36 high schools met, according to John Corts, associate Crusade director. Altogether, more than 370,000 people attended Crusade. More than 9,700 “took their stand” to live for Christ by walking forward during the Gospel invitation. A Mississippi pastor shared Christ with a nightclub singer in the downtown hotel where she worked. She invited Christ into her heart and joined the 5,000-voice choir at Legion Field for the concluding service. Among the guests who gave their testimonies were the Honorable James E. Johnson (Assistant Secretary of the Navy), Steve Sloan (former Alabama quarterback), and Janet Lynn (19-year old Olympic skater). On Friday night, 800 young athletes sat together in the stands as Coach Tom Landry, Ray Perkins (Baltimore Colts) and Mike Kolen (Miami Dolphins) told what Christ meant to them. That same evening, Coach and Mrs Paul Bryant and Joe Namath were platform guests. On the second day of the Crusade, Alabama was stunned by the news that Gov. George Wallace had been shot while campaigning for president in Maryland. He had planned to attend the Crusade later in the week. “We pray that somehow we will learn to live together, if not as brothers, certainly as fellow human beings,” Billy Graham said at the Crusade. Members of the Graham Team were active during the week, speaking in churches, clubs, school assemblies, and other locations throughout Jefferson County. For example, Dr Charles Carter, pastor of Shades Mountain Baptist Church, invited Cliff Barrows to speak in his church one Sunday morning. Mr Barrows accepted his invitation to preach one Sunday a year for the next 25 years.